Navigating today’s environment of employment laws and regulations is a challenge to any business. Reid and Riege provides clients with strategic and tactical advice that stresses best practices, prevention and compliance in all aspects of workplace employment practices. From drafting and updating employee handbooks and crafting employment policies, to providing advice on difficult discipline and termination issues, Reid and Riege provides a comprehensive range of services to help businesses comply with discrimination laws, disability laws, wage and hour laws, family and medical leave requirements laws and other employment regulatory requirements. When necessary, we are prepared to aggressively defend our business clients against employment-related claims and liabilities in state or federal court, as well as in all state and federal administrative venues. We regularly defend employers in discrimination, retaliation, wrongful discharge, wage and hour disputes and in other employment-related complaints. In today’s competitive market, issues such as the retention of key employees, the protection of proprietary information and customer relationships are important to all businesses, whether they are start-up companies, growing companies, or well-established. Effective employment agreements, non-competition agreements, non-solicitation agreements, confidentiality agreements and similar arrangements are often crucial to retain the services of key employees, and to protect a business’ interests in intangible assets such as inventions, trade secrets and other intellectual property, proprietary customer relationships and customer information. Whether it’s an employment and non-competition agreement for a key executive, or a non-solicitation or confidentiality agreement for a salesperson or other employee, Reid and Riege helps our clients craft agreements that protect their business interests in a manner that is creative, practical and effective, keeping in mind each client’s unique business needs. Our Business Law attorneys represent both corporations and corporate executives in legal issues relating to the employment and compensation of key employees. We advise our clients on the hiring and retention of corporate executives, including employment agreements, restrictive covenants, change-in-control agreements, severance benefits and retirement issues. We often advise employers who seek to implement changes in upper management. 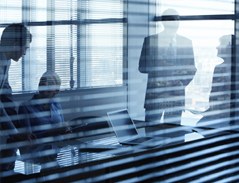 Executive compensation has become a hot legal issue in recent years. Several cases of abuse have triggered new laws and increased scrutiny by shareholders and regulators. We help employers develop a comprehensive compensation system for their key employees by outlining the available alternatives and recommending the best approaches. We have experience with qualified benefit plans, stock options, restricted stock, phantom stock, stock appreciation rights, deferred compensation, bonus plans, change-in-control benefits, golden parachutes and retiree medical benefits. Our attorneys in the Employment Matters Group are often called upon to advise on personnel matters in connection with mergers and acquisitions and when employers seek to implement changes at the upper management level.